Notes: The fort is on a private land with no access but can be viewed from the road. There is no dedicated lay-by near the fort but a farm gate offset from the main road allows sufficient space for one car. The remains of a small mid-eighteenth century fortification (or maybe folly) complete with artillery positions and two towers. The structure is on private land with fairly clear signage to keep clear but the structure can be seen from the adjacent B6342. Care should be taken as this is a national speed limit road with no footpaths. No site for fort but Wallington is run by National Trust. 1. The structure is also known as Cadgers Fort, Cadgers Castle and Rothley Fort. 2. Sir Walter Blackett was also responsible for Rothley Castle - a folly built in 1755. 3. There is some suggestion that Codger Fort may not have been built until 1769 based on documents discovered at Wallington Hall which seemingly commissioned Thomas Wright of Durham to build the structure. It is possible however this related to the Rothley Castle folly rather than Codger Fort. It is also possible the fort, if indeed built in 1769, replaced an earlier structure in which the Woolwich guns had been housed. A folly or a genuine fortification? Sir Walter Blackett constructed Codger Fort on his Wallingham estate with his motivation often being cited as an intention to defend his lands and the route into England during the 1745 Jacobite rebellion. However, evidence suggests it wasn’t built until 1769 which implies the structure might have been a folly. Codger Fort was erected by Sir Walter Blackett in the mid-eighteenth century probably around the time of the 1745 Jacobite Rebellion. He was the son of a Jacobite whose father had fled Britain after the defeat of the 1715 rebellion but Sir Walter had inherited his uncle’s estates in 1728 that saw him become a significant northern land owner. He entered Parliament, representing Newcastle-upon-Tyne, in 1734 and in this role he became well known for his criticism of the Royal Court and his lobbying for the poor. However in 1745, when Prince Charles Edward Stuart invaded in an attempt to restore the deposed Stuart dynasty, he perhaps felt it necessary to make a visible statement of his support for the Hanoverian regime and this would explain the construction of Codger Fort. 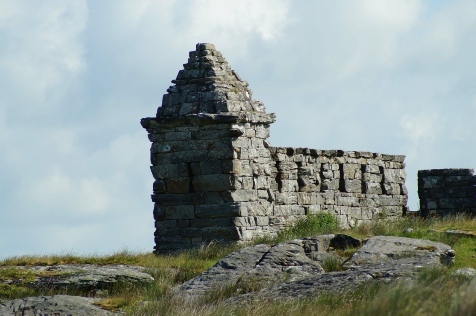 The fort was built on top of a rocky crag and was positioned to control the pass – even today it stands tall over the B6342 which mirrors the road of Sir Walter’s day. The fort had six cannon, loaned from Woolwich arsenal by the Government, which were installed within a four-sided, crenellated bastion. This was flanked by two wing walls punctuated with sixteen musket slits whilst sentry towers, also with loops for small arms fire and unusual pyramid shaped roofs, further augmented the defences at either end. Although no longer in existence, there was probably also a southern curtain wall or earthwork that enclosed the site otherwise it would have been extremely vulnerable to a broad flanking action. Today the fort itself is on private property but can be viewed (with care) from the road (B6342). Sir Walter Blackett's Wallington Hall, which was remodelled during his tenure, is in the care of the National Trust and is open to the public.